Lately I’ve been having too much fun on Facebook. This site was developed for college kids and then subsequently opened up to everyone…which really just meant geeky early-adopters. But something magical happened for me in the past few months. Suddenly friends from high school started arriving. Then my 20th high school reunion happened and I promoted facebook as a place to keep in touch to a handful of people. In a matter of weeks my friend list has grown by a hundred people. I am definitely feeling the network effect. I figured it would be a good time to survey the tools I’m using and the fun things I’ve been doing. Although most of the content I’m interested in lately is on Facebook, I continue to maintain identities on MySpace and Twitter. Ping.fm helps me post to all three at once. I do update my status in various places separately, but ping.fm is handy when I want to shout at everyone. I don’t even have to go to ping.fm itself, either. I installed the Google gadget on iGoogle. I can blast out 140 characters in no time. When I was using Twitter for my primary microblogging, I ran gTwitter as my client. I don’t like keeping a Web page open. I like to have the statuses appear on my desktop. But then I wanted to try using identi.ca. So, I switched to Gwibber. It’s for Linux only. Windows people should try Twhirl, I guess. Anyway, Gwibber supports pulling status from Facebook. So, I get updates aggregated from multiple sources. As I started seeing Facebook status updates throughout the day, it drew me into the site, and I started posting items to my profile more often. The increased activity paired with more friends showing up lead to more usage of Facebook’s IM. It’s nice to have IM built into the Web page, but it’s not nearly as usable as Pidgin, which aggregates all of my various IM accounts. 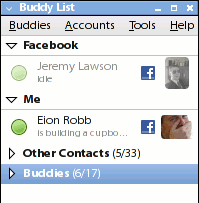 The solution is a plugin for Pidgin that ties into Facebook’s chat. If I’m on Facebook and I get an IM, the title of the tab in Firefox blinks. With Pidgin, I get a new chat window popping up. Plus, I get a log of the conversation. I find myself checking the Live Feed on Facebook more often than I check email. I try to limit email checks to twice a day or so. Generally email is about people wanting something from me. It’s usually more efficient to batch the responses. Status updates on Facebook are about someone giving me information, thought non-specifically. Technology aside, there is a style to using the features of Facebook that can enhance your experience. My friend, Marck, once told me he liked MySpace better than Facebook because the former felt more genuine while the latter felt more corporate and bare. Because of the mix of friends I have on each system, MySpace is like a quiet neighborhood where all the houses are painted purple and orange. Facebook is like an industrial area with raves going on inside the warehouses. I’m sure that so many of my friends were friends in high school factors in, but the bare framework of Facebook seems to encourage us to act a lot like unruly teenagers. The sport is inventing the next goof. Any type of ambiguous comment is an invitation for a joke or mock ridicule. “A picture of my on a boat taken 2 years ago” is an opportunity to ask, “did you ever get the boat back?” And that’s a tame example. It’s similar to the banter that goes on at work without the fear of HR putting you on notice. For a week, several of us pulled a prank on one of our friends by changing our profile pictures to his. Then we started altering the picture by painting his face or swapping in a different face, or putting his face on a celebrity body. Another innovation we’ve developed is the use of the tagging functionality for pictures. It’s meant for identifying people in photos. And if they are on Facebook, they get notified. One thing we started doing was tagging people who aren’t in the photo to get their attention. We also started tagging things in the picture who aren’t people. This allows viewers to roll their mouse over various parts of the picture and see labels pop up. Last July, Facebook said they wanted to advance the cause of bringing people closer together. From my perspective, they are making great progress.